> Research Library > Business.com > Cut costs now with complimentary quotes from top Credit Card Processing providers! Credit cards are an integral part of modern business. Even customers who don't use credit will want to use debit or gift cards based around similar technology. But with such a wide variety of credit card processing technology available, it can be confusing for business owners. 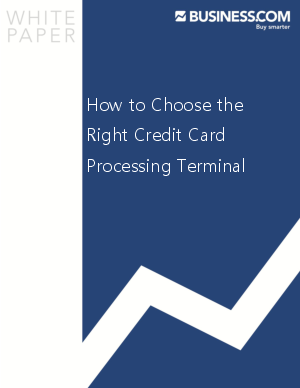 In this guide, we'll take the mystery and guesswork out of choosing the right credit card processing terminal for your business. If you're new to credit card payment, a credit card terminal is essentially a processing point for a payment network. As you swipe the card, the payment is processed and disbursed to your merchant account. The payment network collects a flat fee or percentage of the sales, called a "swipe fee," and often the terminal itself will cost a certain amount of money.